The cost of fires is up 34%, worry about replacing possessions doesn’t have to be. - Scarsdale Premier Insurance Agency | Advocate Brokerage Corp. 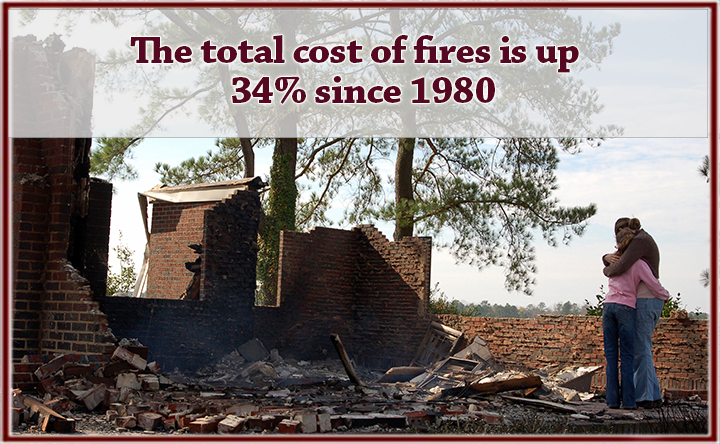 The cost of fires is up 34%, worry about replacing possessions doesn’t have to be. A fire at your home or business can be the most devastating event in your lifetime. Aside from the emotional toll it can have, the cost to families, to companies as well as to the economy as a whole is up, according to the National Fire Protection Association. Across the US the total cost of fire in 2011 was estimated at $329 billion (roughly 2.1 percent of U.S. Gross Domestic Product). Adjusted for inflation, the total cost represents a 34% increase over 1980 (while its proportion of US gross domestic product has declined by about one-third). The total cost of fire is defined as the sum of economic loss and the cost of the provisions needed to prevent or mitigate the cost of fire. Basically it is the cost of property that has incurred damage + any interruption in business added to the cost of fire departments + insurance costs associated with fire protection + the cost added to construction to protect the structure from fire. The NFPA’s complete total cost of fires adds costs that cannot be measured every year or do not involve direct payments. This includes costs of compliance with fire safety standards for equipment and other products, the value of the time donated by volunteer firefighters, human loss (e.g. lives lost, medical treatment, pain and suffering), and federal government costs for fighting wildfires. Fires in 2011 caused $13.3 billion in direct property damage which represented 89% of economic loss that year. The other 11% was indirect loss, such as temporary housing and business interruption. Physical Damage is one thing but what about costs that can’t be measured? There are so many intangibles that fires also destroy, including a family’s sense of well-being. The loss of possessions can be traumatic enough without taking into consideration the effects of relocation, financial hardship and worry for future safety. While fires cannot be prevented, the worry about replacing your belongings and recovering your home can. Is your fire coverage up to date? For homeowners – If you have made any major renovations to your home such as an updated kitchen or a bathroom make over, you may want to double check your fire coverage to be sure it is adequate. Or if you have made a recent addition that adds to the total square footage of the home, it is a good time to update your coverage. For business owners – If you have purchased any expensive new business equipment you need to be sure the coverage you have is sufficient to protect your investment. We can help you protect your assets. At Advocate Brokerage, we’ll be happy to evaluate your homeowners or business policy and compare it to your current circumstances then take some time to assist you in determining that the coverage you have is appropriate for your needs.